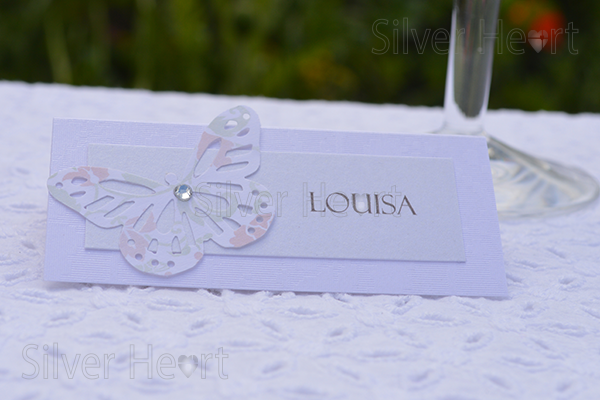 Place Card designs, Silver Heart Wedding Stationery,various formats including flat, folded and laser cut place cards. Wedding stationery suppliers to Huddersfield, Leeds, Wakefield, Holmfirth, West Yorkshire, Yorkshire. Coordinate with your other stationery and the colour scheme/theme of your wedding. Look attractive and make your guests feel special. Are clear and easy to read to avoid embarrassing seating disasters! We are very flexible here at Silver Heart. If you like a card but wish to change the colour scheme or card stock, we are more than happy to oblige. For instance, you may want a particular colour of satin ribbon, broderie card or accessories for your invitation to match your colour scheme. We will do our best to help! We also do Save the Date, Day Invitations,Evening Invitations, RSVPs, Order of Service/Day, Menus, Table Names and Table Plans and Thank You cards.